To build websites, you should know about HTML, the integral technology used to define the structure of a webpage. The main issues with HTML websites was that the scripts and the styles were coded with HTML frameworks and this is the main reason for slower websites. 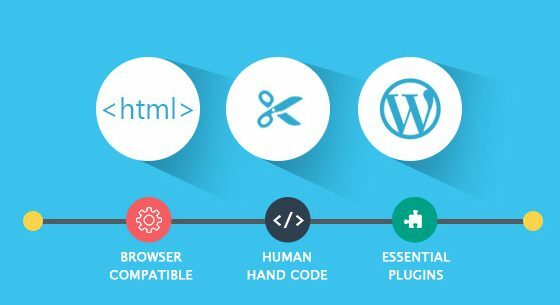 In order to resolve this issue, web developers come up with a contemporary HTML to WordPress conversion technique. Now WordPress powering over 17% of the Web, Does moving to WordPress mean starting over and losing all the time, and money on the current website?. Nope, Migrating an HTML website over to WordPress is actually easier and the performance and speed of the website can be increased. Converting the HTML website into WordPress platform provides a prime benefits. in creating perfect website and blogging platform. Some of benefits of converting Html Website Into WordPress Theme are listed below. WordPress has got a huge community, millions of user blog and security issues will be treated almost instantly. Another good thing about WordPress is that it is an open-source platform and the users keep on contributing to the platform. High level of customizability with numerous themes helps the users remain updated with the current happenings in the WordPress community. Matchable flexibility and continuous support from the vibrant community makes it a noteworthy experience for new users to get involved with WordPress. The HTML websites are static having lots of pages and lines of hard codes. The static HTML websites can be very tough to update like adding new pages, updating content. WordPress websites, on the other hand, are easy to create, manage or update content and with the same reason, it has got a preference over the static HTML website design service. WordPress is easy to use and has a spontaneous user interface, with a lot of functions embedded in the platform, which makes it easy to update and create pages the website. One of the great advantages of WordPress is, it is a universal platform. WordPress is fairly easy to use and new plug ins are created almost daily. Plugins can be used to add display images, SEO tools, social media marketing, etc. The HTML, also support all these, but you have to write the code proper code. With WordPress, the website coding is much easier and this is one of the main reasons for the learners to prefer using this platform. WordPress plugins a offers complete control and freedom to customize the website as per the needs. community. This is one among the major reason to convert html site to wordpress. WordPress can use to create a website depending upon the business desire. Further modification in the look of business website promotes business growth.